Off down the comic shop to pick up issue one of the Wild Storm, very excited! Anyway over all just brilliant comics and while I always struggle with this I think Eric Powell might, just might be my favourite none 2000ad artist... just might! Did you pick up last years' FCBD Prog, Colin? The first volume of Hawk and Dove (New 52) from the library. While I think the concept of two superheroes with powers based around being avatars of War and Peace is interesting... I wasn't keen on this. Nice art though. Really want to praise Close Encounters comic shop in Peterborough. Well stocked shop with lovely staff. Me and the missus went in there this morning and asked if they had any copies of the new "The Wild Storm" comic available. She said, "Yes, of course." Then asked us which one we wanted, as there were variant covers. We said, "We'll take that one, as our lad drew it." She then handed it to us, saying "No charge!" We tried to pay her four times, but she wasn't having it!! She didn't know us from Adam. Wonderful lady. 90's teens will have a passing interest too. I've pre-ordered a copy- unlikely to be disappointed with Ellis & JDH. Big day then Can't wait to get my hands on a copy. Hope it all goes better than the Ellis-written New Universe for Marvel, which was really bloody good for the 5 minutes before his laptop died and we lost everything forever. That's just ace Tankie, icing on an already sumptuous cake! I certainly did. 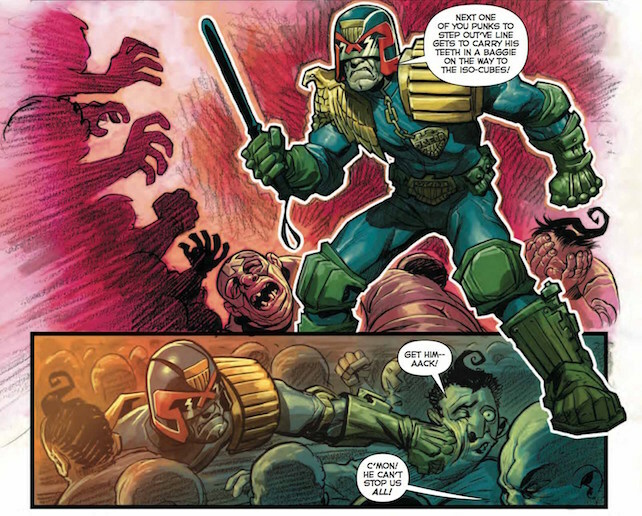 But one strip does not a 2000ad artist make... does it? Nah - though McKean makes it for the contents page of that Sci-Fi Special instead!